Sorry for all the peanut butter lately! 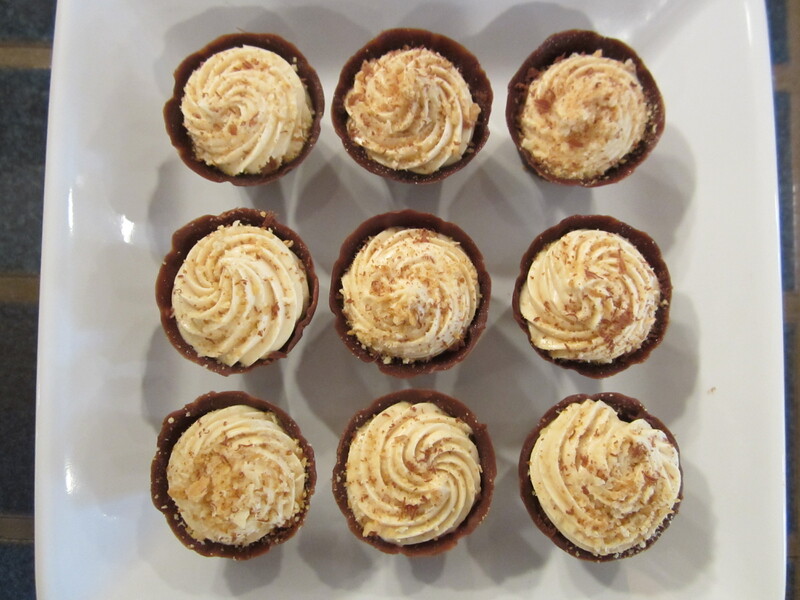 If you missed it, I’m catching up on sweets I made for a peanut butter-chocolate bridal shower. 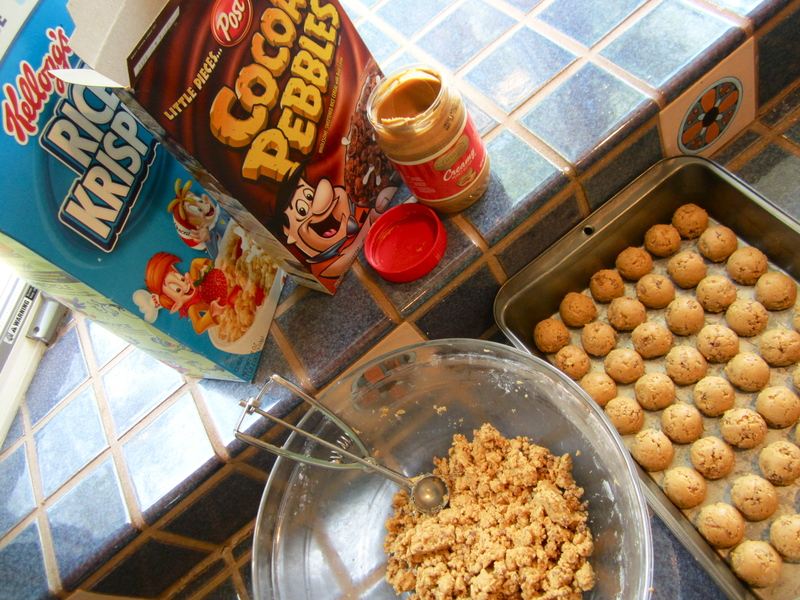 I know there are tons of recipes floating around for peanut butter balls – and everyone has his favorite – but this one is worth writing out. It’s sort of a conglomerate of multiple recipes. Pour peanut butter/butter over [dry] mixture and stir together. Shape into balls, refrigerate till firm, and dip in chocolate. 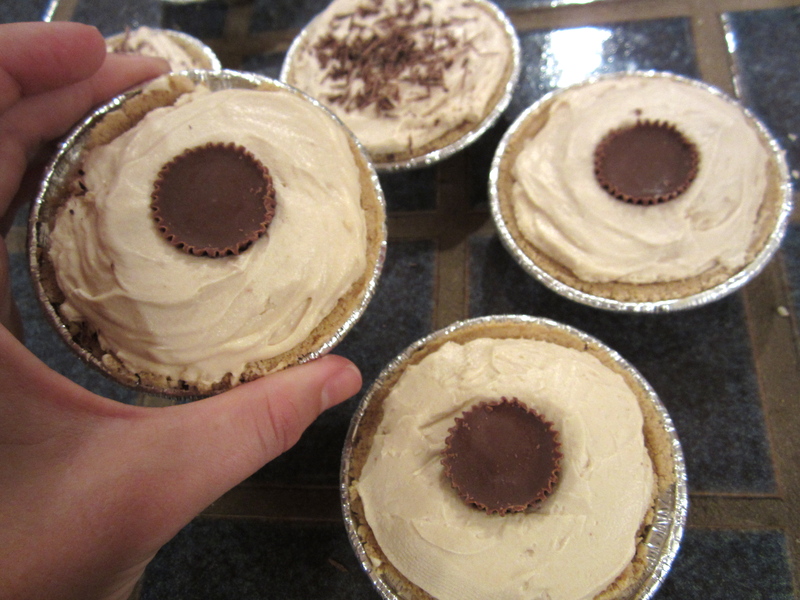 You might want to call these “chocolate peanut butter cups” or something, but I didn’t want them confused with some kind of Reese’s-like candy (like the peanut butter cups I recently posted). 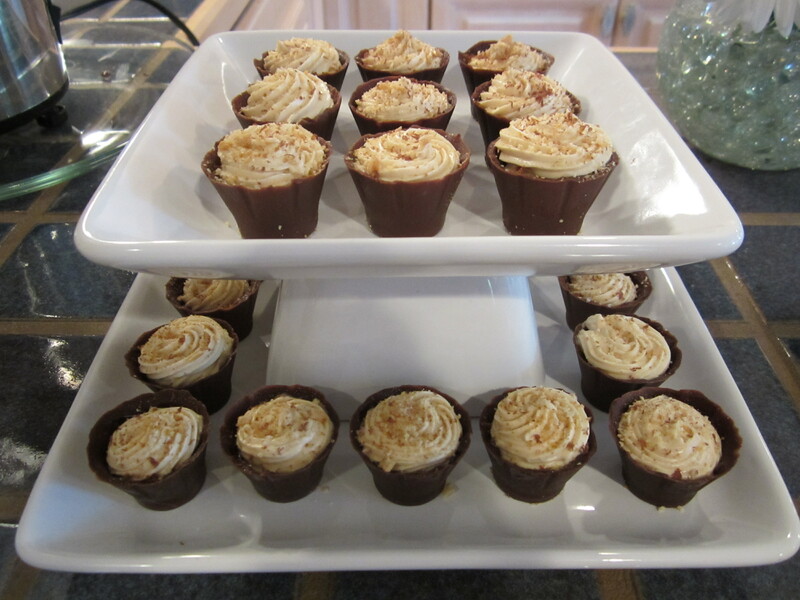 They are chocolate cups, filled with a mixture I adapted from a pie filling recipe. These were a first – and definitely not a last. I used Wilton’s chocolate melting candies (for molds, dipping, etc. – NOT fondue/melting chocolate), but I have also used milk and semi-sweet chocolate. The melting candy stays workable longer, but any of these is fine. The candy mold I’m using is also Wilton. One cup at a time: spoon about 1/3 cupful of chocolate into one cup. 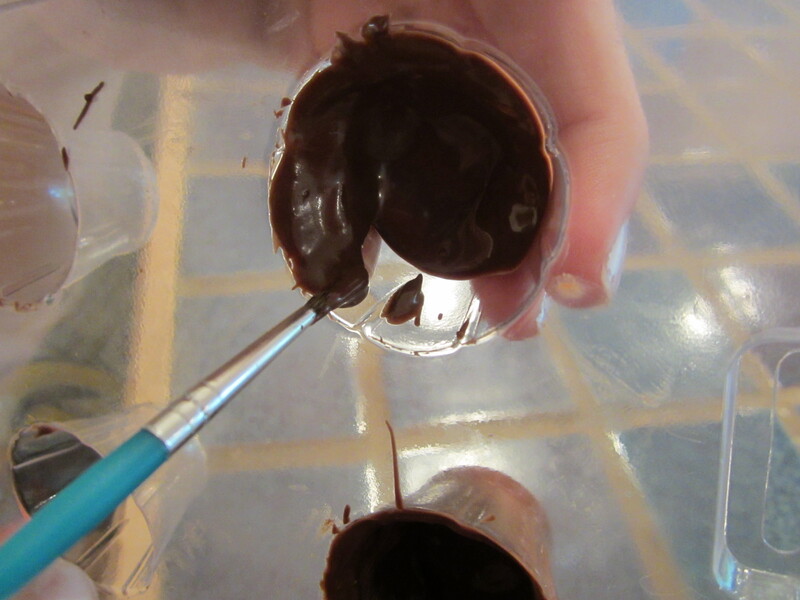 Then use a paintbrush to smooth the chocolate evenly up the sides – make sure it’s not too thin or it won’t hold up! Gravity is your friend. 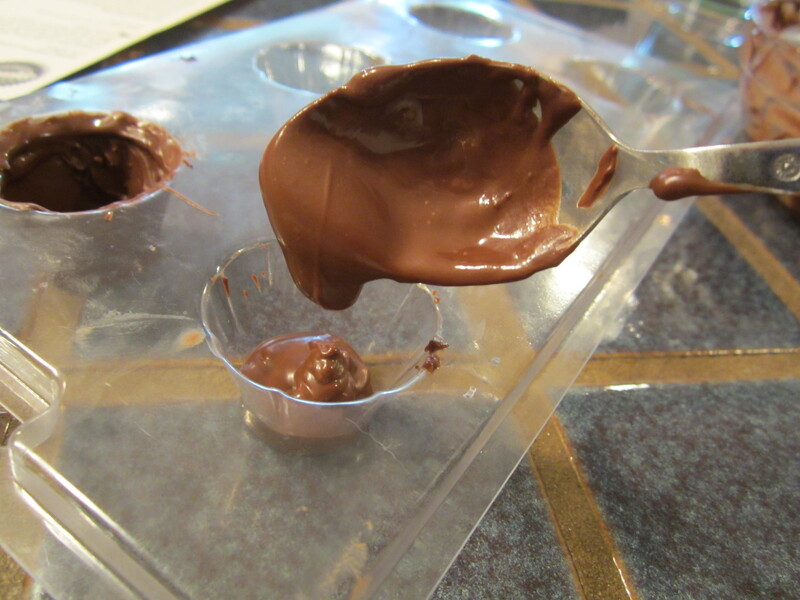 It helps to turn the mold so the chocolate falls where you’re about to paint. After you’ve “painted” the chocolate into the mold, place them in the fridge for a few minutes to set up – then in the freezer for several minutes. Important! When you take the mold out of the freezer, don’t try to push or “pop” the cups out (you might notice that my mold is cracked from trying to do it that way!). Simply turn the mold over above a plate or wax paper, and use your fingers to thaw each cup. If you apply a little pressure, they pop right out when they’re thawed. 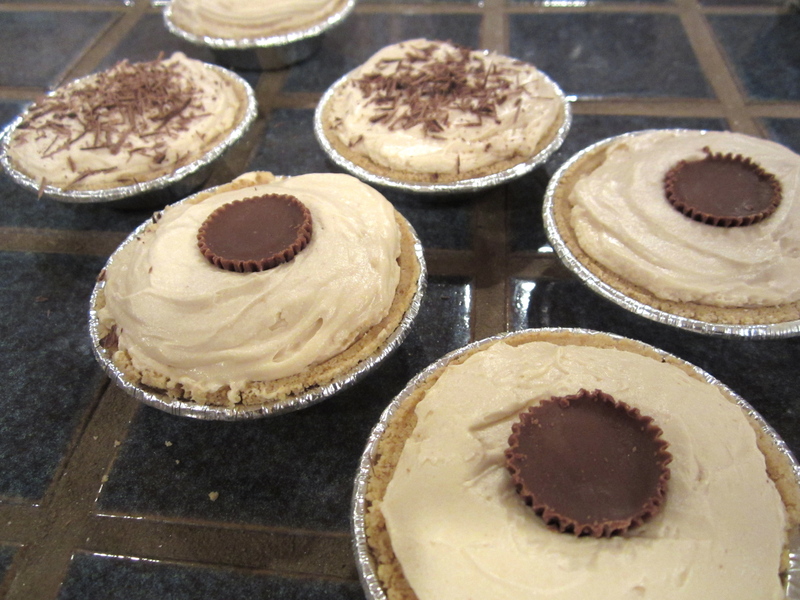 I sprinkled them with graham cracker crumbs (I think to justify calling them “pie” cups), but they’d be pretty with chocolate shavings or nuts.